This Medieval Castle Blog focuses, for the most part, on British medieval history - from haunted castles in England such as Carlisle Castle for example through to British medieval kings and queens and more. British medieval history, however, would not be so fascinating if it were not for the Norman Conquest of 1066 and the ensuing centuries of links with France. Medieval France is, therefore, a very relevant subject to study if we are to understand British medieval history in depth. In recent blog posts, we have started to cover medieval France - eg. the medieval garden at Bazoges-en-Pareds and the haunted Tiffauges castle - and we intend to do so even more. We some stunning photographs and video from a recent trip to France where we visited numerous medieval castles, churches, abbeys, priories and cathedrals. 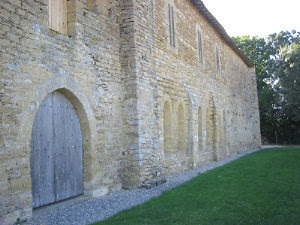 Here is a photograph we took of a 13th century medieval priory in St Prouant (Vendee). Known as the Prieure de Grammont it was founded by none other than Richard The Lionheart (great uncle to King Edward I) and is today one of the best preserved medieval monasteries in all France.